For many years a queen hornet has appeared in late spring around our house at Old Storridge, but this year (2013) after the cold start it was not until 28th June that one first appeared. It is possible that the same hornet took over a bird box nearby in the nature reserve, as it is only a short distance away. It was first noticed in July, while I was doing the weekly butterfly transect walk, when workers were filing in and out of the entrance hole. 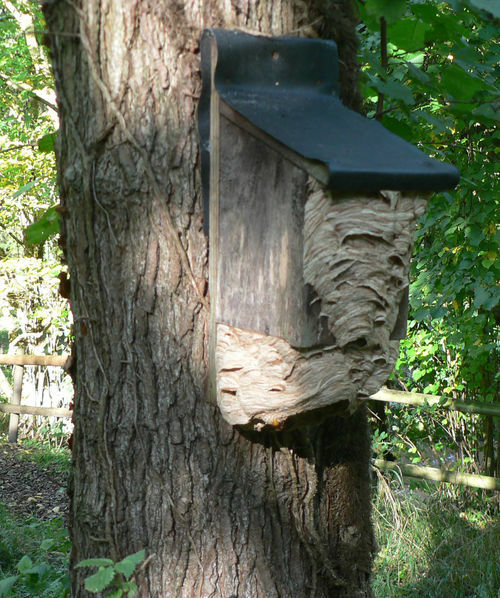 The previous bird occupants would have left the box by then, making it a home again for another species. It is hard to believe they constructed the nest shown in the picture (01) over about four months! At first it was all inside the box, but from previous similar old reports it was obvious they would not stop there. The original hole was at the front, but it was a surprise when they built a basement with no access, unless they had chewed another hole in the bottom. It will be interesting to see if they have, when they all die off, probably after the first frosts. The new parts of this nest were observed to provide at least three entrances, but whether they all went to the original entrance we shall have to wait and see. Assuming the queen is still alive she could be a year old by now as new queens and males usually emerge late summer or early autumn. By the 8th November 2013, on a cool damp morning, there were still workers going in and out of the nest. The nest probably went un-noticed by most visitors even though they passed within a few feet of it, showing how tolerant the hornets are. It was just a couple of kids that got stung on a school visit, and they might have been messing about there. The leaders should have been told, because the chap in charge knew about the nest as soon as it was spotted. 01 Hornet nest on bird nest box, Garth Lowe.